In just over a week, an important conference in Geneva, Switzerland is being held. One of the many things under discussion will be the future of free-to-air television up to 2030. Will the mobile broadband operators be able to get agreement to close down the UHF television band for reuse as 4G internet connections? Digital UK and other TV bodies are very concerned. 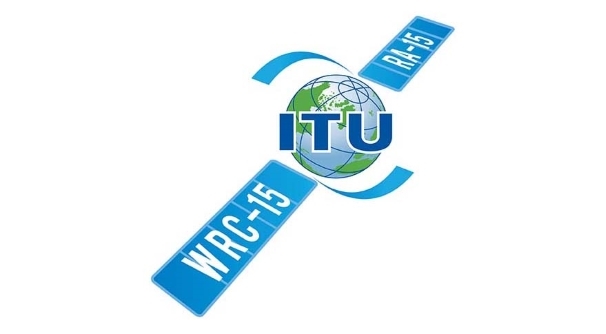 Every four years or so, a World Radiocommunication Conference is held to consider revisions to the International Telecommunication Union radio regulations. The next one runs 2nd-27th November 2015. It will discuss many topics, one of which will be agreeing the use of the UHF radio frequencies band in Europe and Africa from 2016 to 2030. Prior to the Geneva conference, The Wider Spectrum Group - representing viewers and listeners, employees and employers across Europe in the fields of audio-visual, radio, and programme making - met in Brussels and urged protection for Freeview and all European TV terrestrial services. Decisions at this year’s WRC could see remaining TV airwaves opened up to mobile networks. Whilst many countries in Europe have advanced terrestrial networks, others have limited use for them and many in Africa (the same "zone") have none. However, the potential market for mobile broadband internet connections is vast. This diagram shows the old analogue TV channel numbers from 21 to 69. Already the 800MHz band is used for 4G, it is planned for the 700MHz band to be moved to 4G in around 2020. 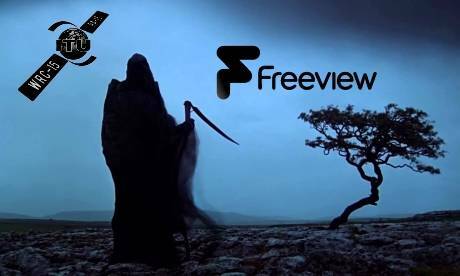 It is expected that the 600MHz band – currently used for the extra Freeview HD channels – will be used for Freeview when the transmitters are shuffled. It is possible that the ITU will decide that 4G is more important than legacy TV. The broadband companies will point out that will High Efficiency Video Coding and ungrouped aerials, TV could use many fewer frequencies. It is certainly worth noting who the big beasts are today. 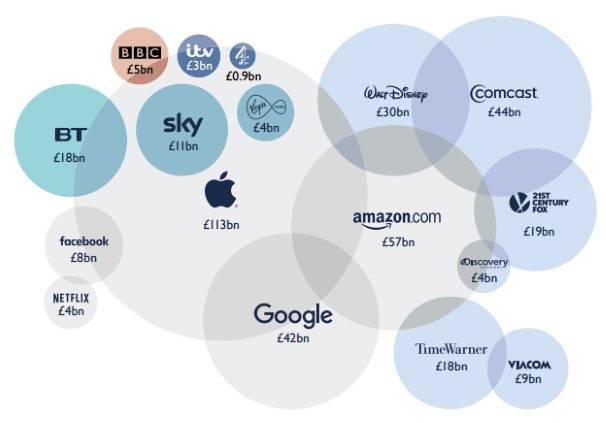 It is popular to think that the BBC is "too big", but would take 23 years for it to get the annual income of Apple. I rather agree, having lived in a very rural hamlet and struggled to get 1-2 Mbps 'broadband' - plus I used to work in the domestric TV industry. The problem as I see it is that Ofcom are charged with regulating both the telecoms sector as well as the broadcast entertainment sector - which appear to incompatible with each other as the telecoms people want to make even more money from preople using what were mobile phones but are now cash cows in the form of portable entertainment systems, otherwise known as 'smart phones'. Analogue TV worked very well for more than forty years with few serious problems and very little loss of channels. Digital on the other hand does suffer from various shortcomings, just look at a selection of the pages here to see some of the problems people have with it. Governments are, in my humble opinion, not the best people to decide about technological matters - but they wield the power to decide for us. And inevitably they rarely make the best choices. MikeG: Its unlikely anyone is going to take away terrestial TV any time soon. Its certainly true that the amount of spectrum it takes up will be less, but thanks to DVB-T2, thats perfectly possible - we all get our cake and to eat it. And of course the greedy Telecoms companies supply us all with mobiles technology - if we didn't use mobiles, there wouldn't be a need for more spectrum. And if we all used our mobile phones just as a mobile phone, as originally intended, then there would not be any need to a vast expansion of the spectrum used to carry social media posts, etc. Mobile phone companies are aggresive in their efforts to make people transfer more data, so having to pay the mobile phone company even more. MikeP: But we also want to use them in more ways, for browsing the web, emails, streaming, etc. But actually, it costs much less to use them that way that it would have done, even 5 years ago. That bandwidth has to come from somewhere, but its perfectly possible for us to have both more spectrum for mobile and make much better use of the terrestial TV spectrum as well. Follow the money is the maxim. Broadcast Freeview will probably last as long as I do (I'm 70!) but I am continually frustrated by poor mobile phone signal. The coverage maps are hopelessly optimistic. Chris Shaw: But they will probably get better - and sometimes it depends what network your on. Last summer, my family was on holiday in the far north of Scotland - and it was very isolated. My wife is on one mobile network, and got nothing. If I went outside the cottage (which had 2ft thick stone walls!) I could get a perfect full signal - much better than the one I get at home. All those UHF channels spend their spare time being used at spectrum for radio mikes and personal monitors. Have you ever thought how present-day TV programmes could be made without radio mikes (and please, please don't tell me you can use VHF/2.4GHz/somewhere else). Content is King they say. Well; no radio mikes = No Content => No King and with the aid of the mobile phone industry we all appear to be sleepwalking to some very silent content.